Stacey Chillemi, Health and lifestyle reporter, expert, columnist and health host. Founder of thecompleteherbalguide.com. You need to appreciate the things in your life. This journal will teach you how to change the way you think. Setting up the journal will be quick and easy by comparison. There are several ways to create your journal. First, purchase a blank notebook. It doesn’t have to be big or fancy, just something small and simple that you can write in. The main thing to remember is that you should be making entries almost every day. Set up a regular time every day to make an entry, whether in the morning or in the evening. Typically the evening is better because it helps you to go to bed thinking positively, as well as giving you an opportunity to mentally review your day, to start, think about recording between three and five things a day. It is an easy target the will help to get you thinking in terms of being thankful. Try to record the date along with your gratitude entries. From here, it is just staying consistent with the schedule. Try to come up with new things every day. The items do not have to be big, but you should make sure to think about your day to find gems that you may otherwise overlook. List this part of your journal the “CREATING THE NEW ME,” section. Write new things you appreciative each day. The sun came out for a few hours after work. Traffic was light on the way home. My daughter had dinner ready when I got home. I tricked my daughter this morning for April Fool’s, and we laughed about it as she got ready for school. The new season of my show starts today. The sun was out again for more time, and I was able to jog for the first time in a week. You can make your entries as simple or complex as you like. Take some time occasionally to read them, particularly on days when you are feeling down. You will be amazed at how quickly you will start smiling. What do you regret not having made more time for? If you had more time, what would you do with it? What are the top ten things in your life that you are grateful for right now? What are you grateful for about your family? What are you grateful for about work? In the back of the journal, take a quarter of the notebook and title it your “Daily Gratitude Journal.” Dedicate the diary to someone you care about and feel close to, someone who would be proud to see you accomplishing these goals and living the life you want to lead. Dedicating the journal to someone, you care about gives you the motivation to want to change for the better. Write about the changes that are occurring in your life and how it makes you feel to reach them. Write about how these achievements are making you into a better person and how they are helping you with your life. Describe what you had to do to achieve the goals. Self-determination is the key to positive change. Self-determination requires that you make an agreement with yourself and keep it. You must have faith in yourself that you are going to change your life by being grateful. Your motivation to accomplish this gratitude journal will become easier as each day goes by. Saying you are going to improve your life is easy, but you cannot just say you are going to improve it by being grateful; you have to take time out each day and think of things that you are grateful for and focus on the good things in your life of not the bad. Reward yourself every time you are grateful. For example, rent a movie or reward yourself with some quiet time to relax and focus just on yourself. To me, there is nothing better than having some time alone with yourself. Do something that makes you happy. Remember, you cannot make others happy until you are happy with yourself. Develop a special time in the day for quiet time. Studies have shown that individuals who have a daily quiet time are less likely to focus on negative thoughts, and more likely to succeed and achieve high levels of success than those who do not. Take a few minutes during the day to write in your journal. Try to make it the same time each day, perhaps when no one is home or just before you start the day in the morning. You could also wait until everyone goes to sleep so that no one will bother you. Give yourself at least fifteen minutes to a half hour. Relax, and while you are writing and relaxing ask yourself the question: “Where am I headed in life with my new way of looking at life and how can I help others by being grateful?” Then write about it. Make sure you are focusing on the things you want to accomplish in life by being grateful. The only way you will change for the better is making sure that negative thoughts do not control your life. You need to feel proud of the changes you are making with this gratitude program. Focus on what you have accomplished. Think about how you feel about your life and what you can do to improve it while writing in this journal. The goal is to let yourself open up and write intimately and honestly about what you are grateful for in life. This journal helps you realize all great things in your life that you should be grateful and it will help you heal your wounds so you can get on with your life. Now repeat this process each day. Each day review the things you have written in your journal. These steps are a new way of life. You are on your way to living a happy, healthy and positive life. There are so many things to be grateful for in your life. Take some time out to realize what they are. Gratitude Journals tend to be most effective when you write about three times at the end of each day. This is a regular enough and simple enough to do and writing at the end of the date tends to bring the best benefits. Remember you want to read your journal entries in the future. This can be a great pick me up when you’re feeling stressed or down in the dumps. Don’t write about the same things every day. Write about various topics will lower the board. 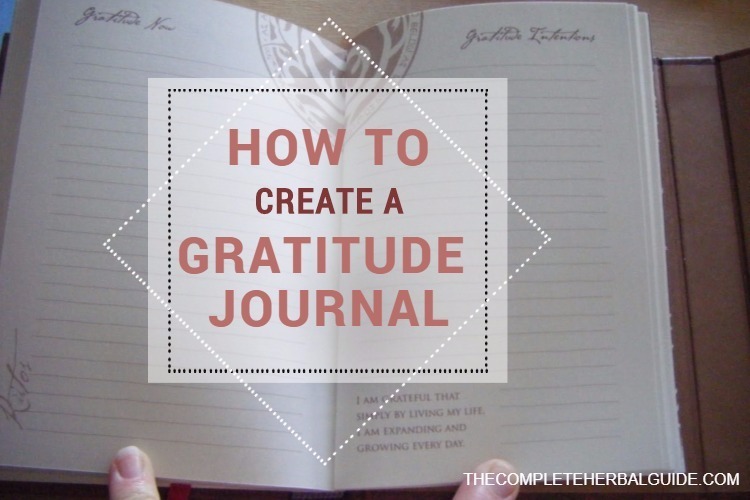 Remember that gratitude doesn’t have to be saved for the journal. Tell the people in your life how much you appreciate them. From people in your family to sales clerks and postal employees you encounter in your daily life, everyone likes to know that they are appreciated and their positive reactions can help you in a positive way. Motivate yourself to get you inspired to begin your gratitude journal. Begin by leaving a comment below with something you are grateful for today. The world wants to know what you’re grateful for in life. Help others see gratitude in a different light. Share what makes you feel grateful. Stacey Chillemi is a health coach and an advocate speaker with a passion to help people eat healthily and live a healthy lifestyle. In 2006, she started The Complete Herbal Guide, which grew to become one of the most renowned websites in the world. Stacey Chillemi founded The Complete Herbal Guide website thecompleteherbalguide.com, which at over 157,000 million monthly visitors is considered one of the top natural health website in the world today. Its main topics include nutrition, natural medicine, fitness, healthy recipes, home DIY remedies and trending health news. Stacey has been a guest on numerous lifestyle and health-related TV and radio programs, and is a recognized health and natural remedies expert, with over 20 years in practice as a Health Coach. Stacey has been a guest on the Dr. Oz Show, local news, and numerous radio shows.